This client reached out because she had seen this gooorgeous 1920's vanity I picked up and posted on Facebook! If you're not already following my page, please Like it at www.facebook.com/forloveofthepaint ! It's a great way to snag new inventory and call dibs on pieces for custom orders! She has a furniture set from Restoration Hardware, and wanted the vanity in a rich black matte paint to coordinate. 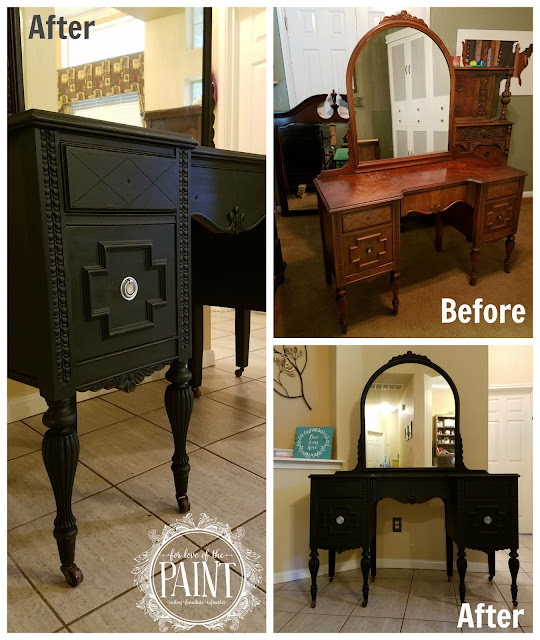 I selected Pure Earth Paint in Onyx, which is currently my go-to black due to its fantastic coverage! Seriously, look at how it brings out those gorgeous carved details! Black gets overlooked as a classic neutral (by me also!) but it is just super chic and timeless. I very gently distressed the high points and edges before sealing, and updated the bronze rings around the mother-of-pearl inlay to a silver to coordinate with the client's crystal knobs.